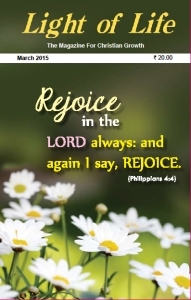 You may subscribe to the magazine either in the print form or in the digital form (PDF file). You can send Rs. 200 by electronic bank transfer to the Light of Life savings bank account No. 003601021256 (IFSC code ICIC0000036) in the Maratha Mandir Branch of ICICI Bank followed by intimating the details (your address, email address and choice of subscription - print or digital) by email to ' lightoflife2777@gmail.com '. The susbscription may also be sent by regular money transfers. However it is important to send your email address for subscription to the digital version. Details may be seen here for the digital version. Write to us from this web site for a free sample of the print version. Editorial: Pursuing happiness - Jacob Ninan says that happiness is not something that can be attained to by pursuit. Abraham’s prayer model - Bernard Thangasamy draws vital lessons from Abraham’s intercessory prayers. Christmas Bonanza - Satyarthi Sahu narrates his experience in Cuttack. God will save your children - Whatever your child is going through, remember there is One in heaven who understands them fully, encourages Annie Poonen. Life within a circle - Sunil Kolhar explains the difference between the cultural circle and the circle of God’s commandments. Mud to gold - Roy E. Joy's tribute to (Late) M. J. Jacob. Singularity of obedience - There is no substitute for love-laced obedience, emphasises Suresh Manoharan. The anointing of God - God greatly values our faithfulness in secret, points out Jacob Ninan. Unsung heroes - Behind the scenes, in any church, are unsung heroes, observes Shantanu Dutta. GO OR SEND! - Thampi Thomas addresses the issue of the primary existence of the church. When our 'Jones' dictate our values - Popularity and recognition are the causes for tension between siblings, observes Hansraj Jain. Poem - You are enough for me - P. Jebaraj. Debate - Should Christians bear with injustice? Visit the archives for editorials and articles from 2008 to 2014.